The central Nave of the CAPC musée, an emblematic space in the history of contemporary art. The central Nave of the CAPC musée d'art contemporain de Bordeaux is the emblematic space of its patrimonial building. It has been the hosting place of memorable exhibitions which have accompanied the history of contemporary art. After Miami and New York, Bordeaux hosts a major solo exhibition of Leonor Antunes. Following her shows at the Perez Art Museum in Miami, in 2014, and at the New Museum in New York, last summer, the Berlin-based artist will be exhibiting her work at the CAPC Contemporary Art Museum of Bordeaux from November 27, 2015 to April 17, 2016. 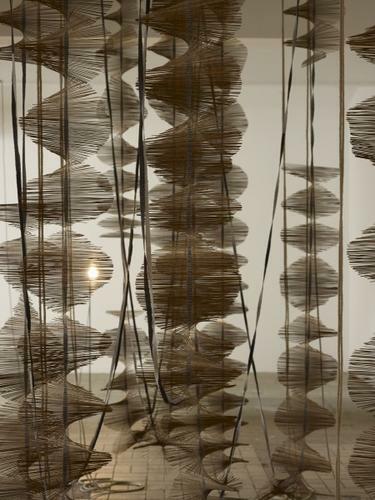 This first important solo show of Leonor Antunes in France has been made possible thanks to the support of our Honorary Patron, Château Haut-Bailly. 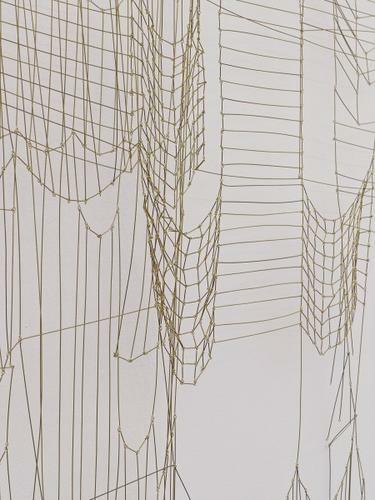 Antunes understands her work as the hybridization of vernacular techniques and the cultural legacy of modernism. 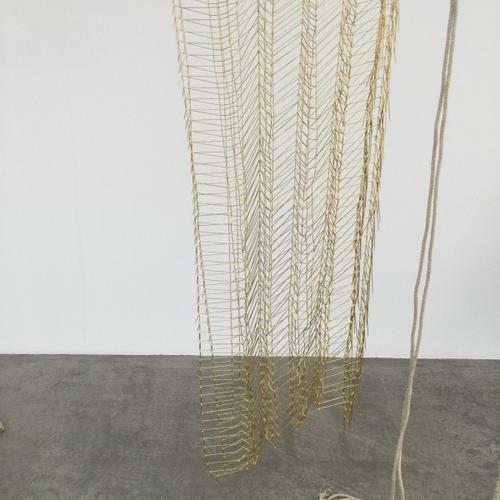 Leonor Antunes's work often refers to the legacy of modernism and its specific geometrical patterns, as well as forms and structures developed by architects and designers of early 20th century. Mathematics, measures, scales and the beauty of certain proportions fuel her practice. Her works enter a dialogue with the spaces they occupy, be it through the way they echo the architecture surrounding them, or by her use of the proportions as tools to develop each new installation. Antunes is particularly mindful of the elegance of handcraft, starting with that of her native country, Portugal, and her preferred materials include cork, leather, brass and cordage. For this exhibition, borrowing its title from Anni Albers’s 1957 essay “The Pliable Plane,” the artist will occupy the 1,500 square meters of the floor of the Nave and display around, and above, this monumental space a series of large scale works, some of them inspired by Anni Albers’s fabric designs, others informed with Lina Bo Bardi’s architectural work. Leonor Antunes’s works will enter a dialogue with the building, echoing both the commercial history of this 19th century construction and the cultural legacy of modernism. Her most recent solo exhibitions were presented at Pérez Art Museum Miami (2014), Kunsthalle Basel (2013), Musée d’Art Moderne de la Ville de Paris (2013), and Kunstverein Harburger Bahnhof, Hamburg (2012). Her work has also been included in a number of international group exhibitions, including the 12th Sharjah Biennial, UAE (2015), and the 8th Berlin Biennial (2014), and has recently been exhibited in venues such as the Bronx Museum of the Arts, New York (2014), Kunsthalle Wien, Vienna (2014), CNEAI, Chatou, France (2013), and MIT List Visual Arts Center, Cambridge (2012). Antunes will be the subject of solo exhibitions at CAPC musée d’art contemporain de Bordeaux (2015), Tensta konsthall, Stockholm (2016), San Francisco Museum of Modern Art (2016), and Museo Tamayo, Mexico City (2017). The exhibition the pliable plane is made possible thanks to the support of our Honorary Patron, Château Haut-Bailly. It is also supported by galleries Air de Paris, Paris and Luisa Strina, Sao Paulo, Wicanders and The Friends of the CAPC.